All you need is your email, mobile, be at least 18 years old, have an Australian address and your credit or debit card from which payments will be deducted automatically. You can sign up on the Oxipay home page or through our online checkout – just select Oxipay as your payment option. 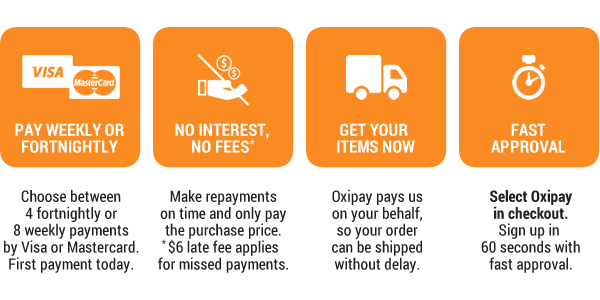 Oxipay is a payment plan that is totally interest free. The only fee is a $6 late payment fee (avoidable if you pay on time). How much can I spend? When are payments due? You can spend up to $3,000. Check your available balance in your Oxipay Customer Account. You decide whether you want to make weekly or fortnightly payments and your payment card will be automatically charged. Your first payment is charged at time of purchase. We will email your payment schedule and send reminders before payments are due. Contact the retailer about any returns. The retailer will notify Oxipay to refund payments made and/or cancel further payments. We’re now accepting humm as a payment method on all online orders valued up to $3,000. No need to wait until payday. For a seamless switchover from Oxipay to humm, your existing product selection and rate schedule remains the same. The change to humm took place on the 8th April 2019. To make it easy, your first transaction on or after this date confirms your acceptance of the new agreement with humm.